Come on board to experience exclusive luxury treatment and visit some of the most exciting destinations in the world. 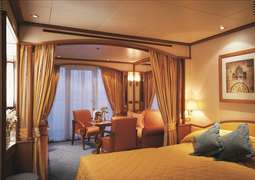 The cabins on the Silver Cloud consist exclusively of suites, all of which are furnished in a modern style. All 148 suites are outer cabins between 23 and 122 square meters in size and some come with a private veranda. 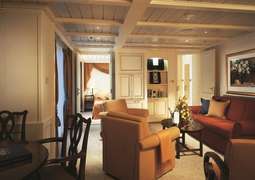 All suites come with butler service, European WCries, fluffy bathrobes and slippers, a pair of binoculars and an umbrella. Champagne, fresh fruit and flowers will be waiting for you when you arrive. For a fee, you can get WiFi internet access. In addition to a premium mattress, you can choose between 9 different pillows. Furthermore, you have your own refrigerator, personalized stationery and a daily news summary. The kitchencrew of the Silver Cloud delights guests with international and modern cuisine from around the world. A particular highlight is the regional specialties of the cruise destinations. During the days at sea, you always have the option to try something from La Collection du Monde. These are specialties of the grands chefs de Relais & Châteaux, which were created exclusively for Silversea and are prepared by talented chefs. The restaurant has no set meal times or assigned tables, so you can decide for yourself when and where you would like to eat. You will also have the opportunity to enjoy cocktails the pool bar while a fresh breeze blows through your hair. If you have a small appetite, the crew provides a selection of light meals for lunch and dinner, including grilled fish and fresh pizza. In La Terrazza, you can also enjoy a breakfast buffet and lunch or dinner al fresco on the outdoor terrace. In the evening, La Terrazza turns into a traditional Italian à la carte restaurant. The Silver Cloudoffers plenty entertainment for guests. 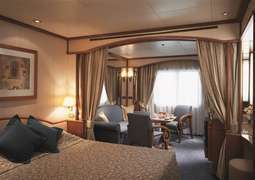 In addition to the numerous bars where you can relax with a cocktail, hit the dance floor or listen to live music, this luxury liner also boasts a beauty salon, spa, boutiques, a casino and a fitness center. At the library you will find books, magazines and audio books, or movies that you can borrow. Evening entertainment will be provided in the show lounge. Every seat enjoys an unobstructed view of the stage, where you will find a wide range of entertainment. In thebeauty salon you will find various services such as hairstyling, manicures and pedicures for both women and men. Relax your body and mind and enjoy a facial, body treatments or a range of massages. Men's and women's saunas and steam baths are ideal for relaxing after a workout or before your spa treatment. Appointments for these free services can be made on board the ship, or in advance online under "My Journey". Silverseacruises focus on relaxation and, therefore, the dress code is more relaxed and casual. Nevertheless, it is also possible to dine and attend special evening programmes in more elegant attire.